Until Jos Verstappen came onto the Grand Prix scene Gijs van Lennep was Holland's most successful racing driver. This smoothly styled Dutch aristocrate became legendary in sportscar racing, first forming a famous couple with Dr. Helmut Marko, the pair winning Le Mans for Porsche in 1971. 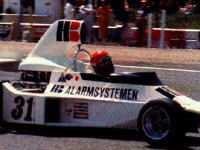 With the help of Jacky Ickx he did it again in 1976. In between Van Lennep had an on-and-off Grand Prix career, never getting to drive more than 3 GPs a year, mixing his F1 drives with sportscars and F5000, while his intended full-time drive with Surtees fell through at the last moment. Still he managed to score two World Championship points, one each for Frank Williams and Mo Nunn, on moments when their cars were hardly the class of the field. Because of Dutch company HB Bewakingssystemen (Alarm Systems) sponsoring Ensign at the time, it was logical to ask Van Lennep to fill in for his sidelined countryman Roelof Wunderink. Here, at Ricard (seen exiting the last corner), he didn't do any miracles but at the next race at the old 'Ring he scored an unexpected point for Nunn. Still, the Nürburgring was to be his last GP, being replaced by Chris Amon for Austria.